The Most DELICIOUS Gluten-Free Desserts!! Are you on a gluten-free diet??? The answer is becoming Yes more and more these days as many people switch over to gluten-free foods for health, diet and weight loss reasons. I personally do not NEED to eat Gluten-Free, but many organic foods are also gluten-free so our family does eat gluten-free products on a regular basis. But to be honest, I still have a little prejudice against Gluten-Free foods. Sometimes, I feel like they don't have as much taste, sweetness or are as moist as other foods. But I was DEFINITELY proven wrong lately when I tried the Gluten-Free desserts from Sweet Sally's Bakeshop! She offered to send me some of her gluten-free desserts and I was a little wary wondering if they would be as sweet as I want and like! But have no fear (and don't be judgmental like ME!) because her desserts were A-MAZING!!! The taste, moistness and sweetness surpassed many other regular sweets I have had before! Sweet Sally's Bakeshop is a Kosher Bakery and mail order desserts specialist. They offer Kosher cakes, cookies, bars, brownies, scones & Gluten Free products. The Gluten Free baked goods are equally as delicious as traditional items and they're continually testing new recipes so they can bring you the latest and greatest gluten free desserts. And if you doubt my opinion...Bergen Health and Life Magazine has also recognized Sweet Sally's Bakeshop for making the best gluten free products in Bergen County, NJ! I received the amazing and delicious Gluten-Free Bucket of Sweets from Sweet Sally's Bakeshop. It contains family favorites: 24 Chocolate Chip Cookies and 28 Brownie Bites. They are made from scratch...like grandma always baked! When this bucket of goodies arrived, I immediately dove in (maybe a little timidly) but I was excited to try these gluten free desserts! It was divided between Brownie Bites and Cookies. Sadly, the cookies were pretty thin and were all crumbled and it was like Cookie Bites. But that did NOT change the taste! The Brownie Bites were by far my favorite! The minute I put them in my mouth, they instantly melted in my mouth and were like biting into heaven! These were the most moist and richest brownies I have ever tasted and everyone who came through my door got a bite of this heaven...AND LOVED IT! The cookies were also really good and my husband ate these up like crazy! They were thin but had a little crunch and a lot of sweetness! I am so glad I tried these gluten-free desserts from Sweet Sally's because now I will never turn down a dessert just because it is Gluten Free and I won't be biased against them again! If you are living a gluten free diet, I hope you don't think you can't enjoy tasty, rich, and moist desserts because YOU CAN! Just head over to Sweet Sally's and pick out your favorite sweets! You won't be disappointed!!! 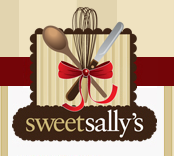 Buy It: You can purchase the Gluten Free Bucket of Sweets for $50 on the Sweet Sally's website.